Vice.com recently wrote an article about how idiots feel that beards are no longer cool. 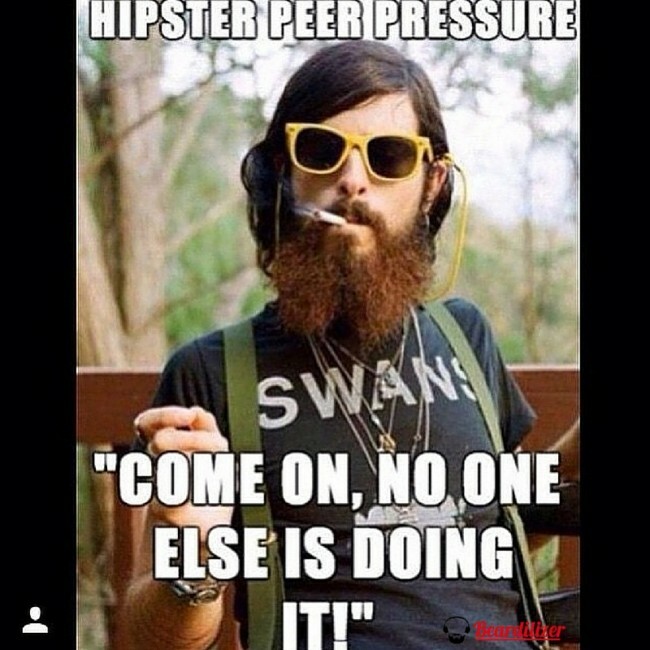 Clearly they knew that they were in the wrong since even the author went on to discuss how a 24 year old hipster does not define what is cool nor does it take away from the fact that 67% of men in New York (aka the vainest place in the world) have a beard. Since there is nothing worse in the world than an insufferable hipster, there are a few ways to make it clear that you’re not a fair weather beardo. Ignoring what the baby faced tiny bro says is part of knowing who you and your beard are. Beards have always been cool but growing a beard just to fit in is weird. Consider why you’re growing your beard – is it just to make your face look better or is it out of an organic love for not shaving? Do you want to compete? Do you think that’s totally feasible for you to carry a twenty pound weight with your moustache? Okay, then you are definitely not some trendy hack who just wants to look like Snively Whiplash. When you grow your beard out, start by taking the Beardilizer supplement. If you’re already working on some solid growth think about what you want to do or how you want to frame your face. The hardest part about taking care of your beard during the summer, since it is right around the corner, is learning what you’re going to do with it so you don’t look like you just learned how to beard. In order for you to keep your reputation under control, it’s important to keep things in perspective. Hipster beards are the absolute worst but what is even worse is some beardless child insulting all beards simply because they cannot grow one! Thankfully Vice is there to pick up this biting commentary in an effort to better educate you, the bearded people who are most likely to read the article, the opinion of a guy whose face certainly isn’t going to win any awards, unless it’s ‘best invisible beard’. Beardilizer has a sense of humor so all of this is in good fun; we know that our products are awesome and that beards are never going to go out of style despite what click bait says. Our beard team goes around the globe and wins awards! Having a beard means more than owning beard wax, it means that you actually use the beard wax! Don’t grow your beard to blend in; grow your beard because it is glorious and because it is what you want to do. Embracing your beard even if you’re in it just to see how it goes, it’s important that you’re using the best products out there. Beardilizer does nothing but make it easy for you to pick up all of the supplies that you need to either started or maintain your situation.